Turn of the Heart is part of a series of films made for Bavarian public television. What led to the failure of the marriage? What happens when both partners, separately and together, tell the camera how it happened? Susi was 18 years old when she met Dieter. He is 10 years older and works as a train driver in the Berlin underground. Susi starts working there too, getting the trains ready. Her present husband is Udo, who also drives trains in the underground. 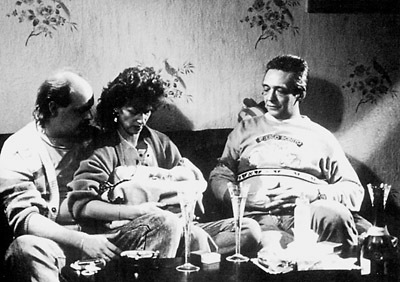 Today all three are sitting amicably together in Susi and Udo's living room, which was once that of Susi and Dieter. What happened?Dieter wants to have a child with Susi. He receives fertility treatment and after 4 years Susi gets pregnant. Both agree that this period before the birth of their son is the happiest time of their marriage. That changes when Susi becomes pregnant again. She refuses to have an abortion and has a daughter. They drift apart sexually and Dieter's debts get even worse. Susi starts working in the Underground, with her shifts starting when Dieter comes home. The couple grows apart, forgives each other but still can't prevent the final break. Susi falls in love with her colleague Udo. When she tells her husband about the infidelity, immediately he calls for a divorce. Susi becomes pregnant with Udo's child. Susi and Dieter get divorced. Dieter moves with his son into an apartment. With her daughter and her second husband, Susi awaits the birth of her third child. They are hopeful about the future. What led to the failure of the marriage? What happens when both partners, separately and together tell the camera how it happened?